Spice up your sewing space with this fun, bright and funky limited edition fabric chair. This Fun, Bright and Cheerful fabric is sure to match your creative flair & workspace! Our Horn Sewing Chair is a perfect accessory for any craft room. The chair's back support provides good lumbar support and it's comfortable, high density foam cushion is comfortable for those long sewing hours. Specially made fabric by Alexander Henry is a heavy commercial grade durable upholstery fabric. Our chair features 4 castors for greater movement at your sewing cabinet or crafting surface. Lift the seat to reveal a hidden storage compartment for your haberdashery or patterns. The Chair is rated to a Maximum User Weight of 95kg. Finally a table that easily adjusts to allow a custom height for everyone. The all in one cutting and sewing adjusts to the perfect height specific to your individual requirements and needs. Adjusts to a low sewing height of 690mm to a high cutting table height of 920mm - Big surface area is ideal for cutting and quilting those larger projects - Brand NEW flat bed design means no lip with the clear Perspex inserts - Maxi size manual lifter for free arm and flatbed positions - Sturdy and Stable Quality construction: - On four locking castors so the table won't move when being used and easy to roll away when not in use - Quality Beech 25mm melamine table top and strong reinforced metal frame - 90 degree tilt top table saves on space when storing - Conditional one year warranty on materials and workmanship. Available in Beech. The new Horn Hobby/sew table is a sturdy table that offers free-arm and flatbed sewing for those large sewing machines on the market. 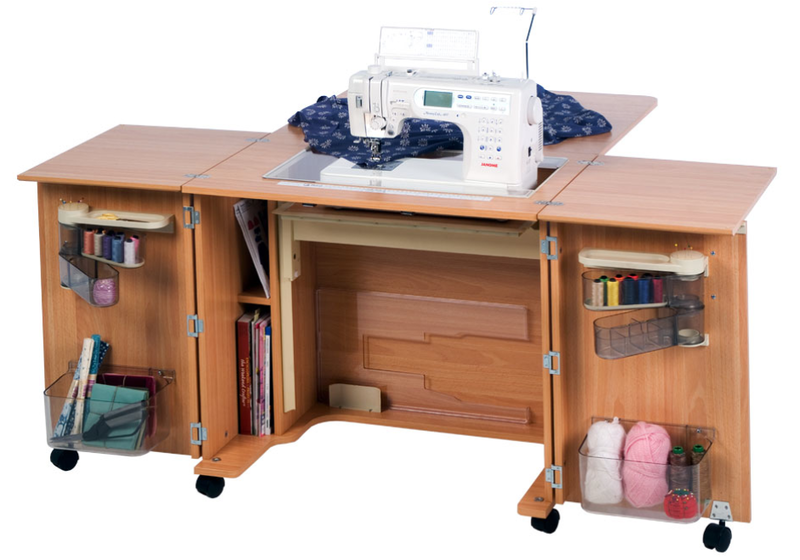 This hobby sewing table is a sturdy table that offers free-arm and flatbed sewing for those large sewing machines on the market. The opening is 527mm wide x 285mm deep and will support an 18 kg sewing machine! The steel locking legs offer a sturdy base, but fold up neatly for easy storage. With a Velcro strap to secure the legs in place and 2 wheels on the under side of the table it is easy to move around the home, to take to your sewing classes or take away in your caravan while travelling. The tough melamine surface is mar-resistant allowing for years of use creating sewing and craft projects. The Table is a great addition to Horn sewing range and will be usual for addition work space in your sewing room or for the beginner sewer. Available in White. The Kensington is compact, glides easily into position on large strong castors and is fitted with the longer lifter for the new longer armed machines. It lets you use both a sewing machine and an overlocker and has maximum storage and a sewing area behind the machine. Room to use and store both sewing machine and overlocker. Finally a compact cabinet dedicated to the quilter with a limited space. The Outback MKII cabinet is a compact cabinet for all the larger machines which has the Horn maximum lifter and has the extra depth in the cabinet and a full sized back flap for extra support at the rear of the cabinet. 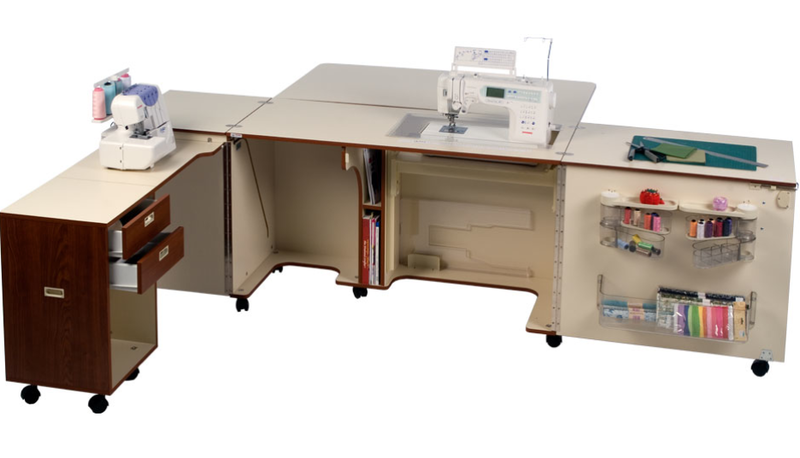 Extension Table: The extension table fills in the gap created to the top left hand side of the open cabinet, whilst still providing a compact quilting cabinet. It is the exact width and length to match the Outback MKII. When finished simply remove the top and fold up your cabinet to a stylish and compact piece of furniture. The Extension Table can be sold separately. Full sized cabinet with great storage and value for money. Available as ready to assemble product. Simply, open the cabinet, raise the machine and you are ready to sew! Simply open the cabinet, raise the machine and you're ready to sew! Space for your machine and overlocker to use and store! Ideal for sewers with limited space but where practicality and functionality are still important. Limited space at home and a modest budget? You still deserve the very best value in sewing furniture! The most compact model makes a mini sewing room. Treasure Chest: The versatile storage unit that doubles as a cutting table. This large strong drawer unit has a hidden talent, doubling as a cutting table: simply lift open the top to create a large working surface perfect for laying out and cutting your fabrics. Available in Traditional Oak. Drawers on easy glide runners. 9 drawers in total with 1 double draw deep enough to store a machine or over locker. On castors for easier mobility. Doors are hinged with 270 degree hinges so will sit flush against the sides when open. The larger of our two cutting and storage tables which is the ideal working height for cutting. Also suited for many other uses where a large working surface is required. The ultimate accessory storage table! Ideal for all your craft and hobby Needs! Folds away for another day!! It's a great idea! So convenient and easy to use. No more bending, kneeling, stooping or using the kitchen table. The perfect answer for Craft and Hobby Enthusiasts. This versatile table cabinet has been especially designed with the professional home and commercial embroiderer in mind. Made to exacting technical specifications to cater for heavy duty embroidery machines it combines good looks with functionality, strength, adaptability and durability. 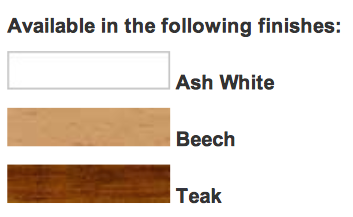 Available in Beech. 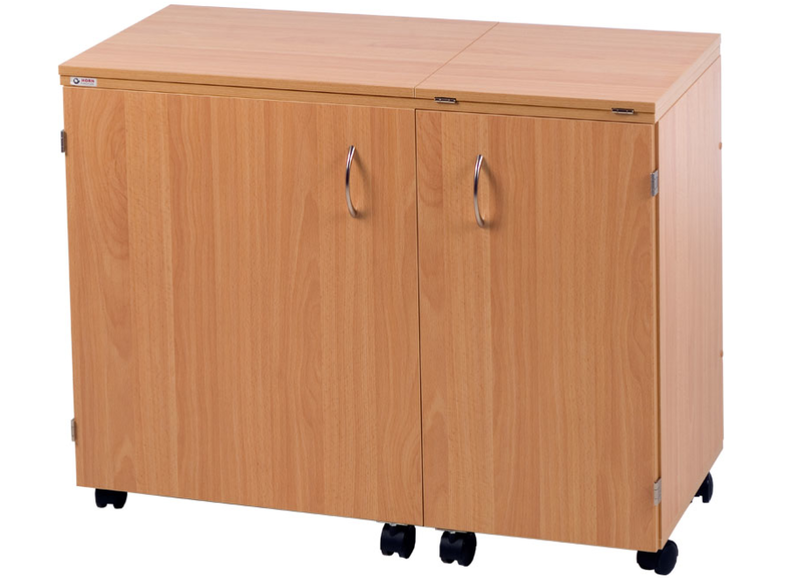 This table cabinet has a 25 mm working surface that can be extended to a large working area of 1800mm X 680mm at the comfortable height of 935mm. The amount of storage in the three (3) standard and one (1) deep drawer is complemented buy the extra storage available in the open shelving in the unit. The extendable working surface is readily reduced to 830mmX 680mm when not in use and the strong castors allow for easy movement and storage when necessary.